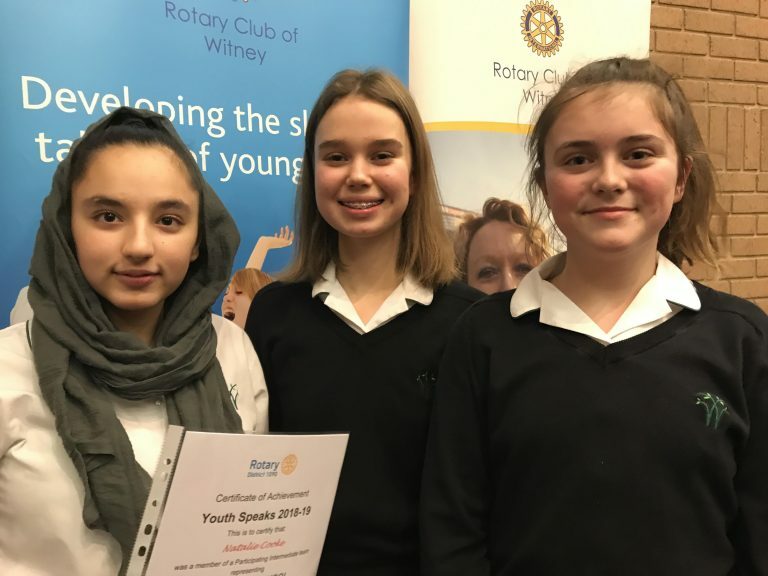 Well done to Tillie, Alishba and Mabel who, reading between the lines of comments made, were clearly runners up in the Zone Final of Rotary Youthspeaks performing at the Congregational church in Witney last night. The judges spoke of what a pleasure it was to hear young people speak. The competitors were praised for being interesting and enlightening and for giving the older generation a sense that whatever is going on in our world today, the voices of the younger generation assure us that it will all be alright. They spoke of the confidence and ability across the competition and how impressed and amazed they were at the level of preparation through research and illustrations so wide and varied. Interesting, relevant and thought provoking the passion of all who spoke was outstanding. The Wychwood girls had certainly ‘upped’ their game since winning the last round of the competition and it was clearly a very close decision on the night. Well done girls we were very proud of you. Huge thanks to all at Rotary for making this competition available to the young people across the country. What an excellent experience it is for them.